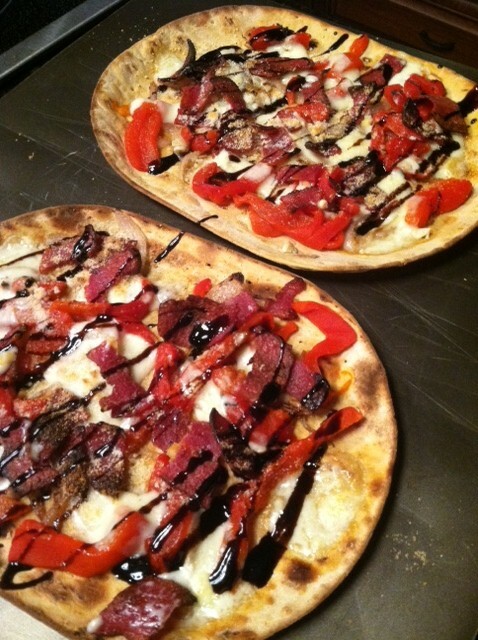 What do you get when you combine roasted red peppers, shallots, bacon, garlic, and fontina cheese with a BALSAMIC GLAZE? A Sweet and Savory delicious guilt free pizza, that’s what! I’m on a major balsamic vinegar kick lately and I found this yummy recipe on How Sweet it is for Red Pepper Fontina pizza with a balsamic glaze and of course I had to whip this up “piggy style”! 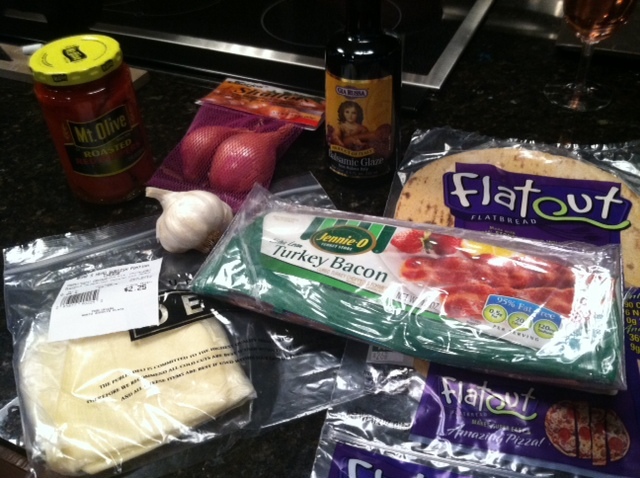 So first thing I did was “De-Calorize” the original recipe substituting flat-out bread for the crust and turkey bacon. Cook turkey bacon in microwave, cut into bite size pieces. Heat some olive oil, add shallots till caramelized. While shallots are cooking, pat jarred red peppers dry and slice. Brush olive oil on flat-out bread, sprinkle garlic, top with shallots, red peppers and bacon. Tear one slice of the fontina into pieces and evenly distribute on each flat-out bread, sprinkle a little reduced fat parm if ya like. Broil until cheese is melted and flat-out edges are curled up. And finally the best part… the balsamic glaze ( a balsamic glaze is the beautiful end result of reducing down balsamic vinegar). Sprinkle the glaze on top of the pizza. 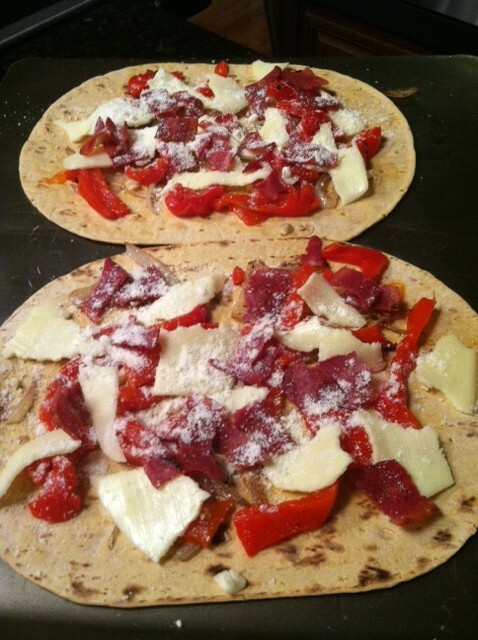 Really cool idea to use the flat bread! Definitely unique, and really tasty looking! Love the pics, keep ’em coming~! Thanks! It really is yummy;) Just subscribed to your blog, can’t wait to see what your journey is like while your rockin’ it Russian style!